Traffic reports and the weather dominate local news bulletins in Washington, as they do in cities across the globe. But commuters to the US capital city have an unusual way to beat the jams come rain, sun or snow. As the sun begins to rise, the people start to gather. Some have walked from home, others have taken a bus or parked their car in a nearby lot. To the uninitiated it seems they fall into line at a random location, but these people know exactly what they are doing and where they are going. A car approaches, the driver winds down a window and calls out "18th and M". 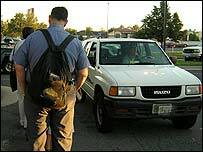 "18th and M, thank you," reply the first two people in the queue before they climb into the car and start another "slugging" trip. Washington's slugging phenomenon began more than 30 years ago in response to the introduction of "High Occupancy Vehicle" (HOV) lanes on the crowded main roads leading from the suburbs to the city. At certain times of day, cars must be carrying at least three people to use the lanes. Casual car-pooling began as solo drivers picked up passengers from bus stops, offering to drive them into the city for free so they could dodge the jams in the non-HOV lanes. The story goes that the word "slug" - used as both a noun and a verb - came not from the mollusc but from bus drivers who had to determine if there were genuine passengers at their stop or just people wanting a free lift in the same way that they look out for fake coins - or "slugs" - being thrown into the fare-collection box. In the intervening years, slugging has become so organised that there is now a range of routes, each with specific pick-up and drop-off points for both the morning and the evening commute. There are also accepted rules and etiquette for drivers and passengers. It all seems to be smooth and well run, even though it remains purely a user-driven system with little or no official input. New routes or stops are developed if there is the demand by drivers and passengers, the use of the HOV lanes eases congestion on the roads and there are fewer vehicles generating pollution. A spokesman for Fairfax County police - which contains the Virginia suburbs where many slug routes originate - said they had no experience of any crimes associated with slugging. Slugs have also set up their own websites with route details as well as message forums to discuss issues or possible new lines - which tend to start and finish near bus or train stops to offer slugs an alternative if there are no cars. 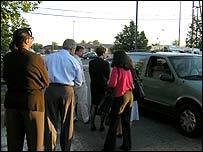 Both drivers and slugs on their way to work from Springfield, Virginia, one morning recently told BBC News Online they saw no disadvantages to their unusual way of commuting. "It saves time, it's very convenient and the best part is it's free," said Edward Carniro as a car stopped to whisk him away. 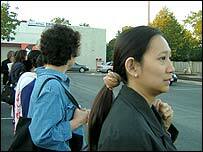 Demile Nguyen, who has been a slug for nine years, said she saved $9 a day and her commute was cut from an hour and 15 minutes to just 30 minutes to and from her downtown law firm. "In the summer it's a bit slow but when it rains it's OK - more drivers stop," she said. On this sunny but cool morning outside the Springfield Plaza shopping centre, it seems to be a slugs' market, with drivers queuing up for passengers rather than the other way round. Nancy Sutton said the addition of passengers allowing her to use the HOV lanes slashed her driving time to the Reagan Building, three blocks from the White House, to just 18 minutes. "I've been doing this for 16 years - it's like a barter system that works for everyone." The enthusiasm seemed justified on a slugger's ride down the I-95 with sisters Dorothy and Shelia Lenoir. Traffic in the others lanes had ground to a halt while we were still cruising along at 65mph. Even when some congestion slowed the HOV lanes, cars there were still going far faster than those in the adjacent jam. "So far it's working well," said Shelia, who started picking up slugs in July. "It saves a whole bunch of time." News Online's unscientific experiment backed that view. Even with hold-ups that the sisters described as unusual, the slug ride took 40 minutes to the drop-off just two blocks from the office - a journey which could take up to two hours in the slow lanes.